We shop as long as we want ..and we have a lot of FUN! Our motto is: "Life is uncertain - eat cake!" Join us today, for an unforgettable trip of a lifetime! SPICE UP YOUR LIFE with Venus Adventures, the No. 1 travel company for women! Specialists in women-only holidays to fascinating destinations. Travel is very liberating because it allows you to be yourself, especially when travelling with other women. When on holiday with Venus Adventures, you are no longer someone's mother, wife, boss or employee - you are just simply you. There is no doubt about it, our trips are special! Our guides care about your experience, which is why we have so many returning clients. Come with us and catch the Venus Adventures travel bug! We take care of everything so you can just relax and enjoy your holiday. Why go on a Venus Adventures women-only holiday? See Julie making changes for women on the Sinai Trail. And here in a Guardian photo story. Sign up for our bi-monthly newsletter and be kept up-to-date on new trips! 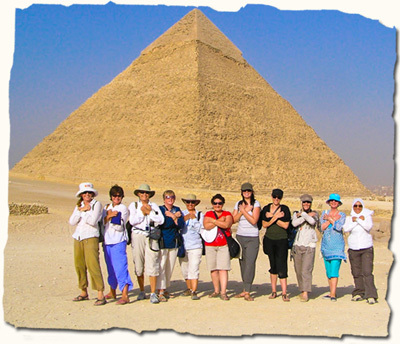 • Travel with like-minded women: it's like travelling with friends! 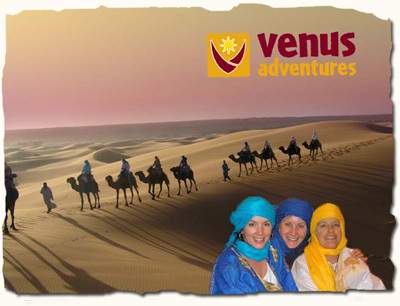 Venus Adventures specialises in women-only holidays and travel. • We take you to amazing and exotic places which you might not visit on your own. You can enjoy these places in the comfort and safety of a group. • Time for some fun! Some trips are more cultural, some are more adventurous, all of them are fun. • Take on a new challenge: If there is a great little adventure to be had, we do it - but we only do things that are fun and worthwhile and add to your experience. This might be a scenic hike in the mountains, or a camel ride into the desert, or even a fun raft trip. • Meet the locals: We make sure you have interaction with the local peoples to really get to know them and how they live. • RELAX you are on holiday! Venus Adventures trips are all-inclusive, so no need to worry about money on the trip (… except when you might go mad shopping). In fact there is nothing to worry about at all, because we take care of all the details. • Enjoy: We sample the local food, we stay in clean, comfortable accommodation (twin-share basis, but single supplement available on request). • Travel in a small group: for a more authentic experience. • Help out: In certain destinations we "give back" to support communities, schools or hospitals by donating clothes, school books etc. Always a rewarding experience. • Respect: We adhere to a responsible tourism code, respecting the people and environments we travel in. • Make new friends: When traveling with other women, you won't ever feel lonely, confronted, or excluded - it is an encouraging and supportive environment, where you can let your hair down. • GET SOME EXCITEMENT IN YOUR LIFE! JOIN US ON A WOMEN-ONLY ADVENTURE. Do you like Eating and Walking? Enjoy delicious local foods and wines, and enjoy stunning scenery on beautiful walks - join us in Italy or Spain in 2019 on one of fabulous and very popular Eating and Walking trips. And there will be lots of culture and fun thrown in too! REMEMBER: On a Venus Adventures women-only trip, age does not matter, your attitude does! As long as you are fit and healthy, you will love our trips! India Highlights | Italy Tour - Walking & Eating! | The Best of South India | Morocco Odyssey | Spain Tour - more Walking & Eating! Venus Adventures™ | © 2007 Venus Adventures Ltd., All rights reserved.